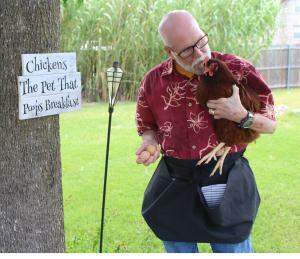 For backyard chicken farmers and gardeners who want to collect smiles along with their eggs and produce. ROCKWALL, TX, USA, July 6, 2018 /EINPresswire.com/ — Nikki Stewart, owner, designer, and creator from Narley and Chikki, is releasing the brand new Farmhouse Fresh Collection, and each product will be individually made by Nikki and her husband, Charley. The Farmhouse Fresh Collection is being released on July 6th. Narley and Chikki is known for helping people who long for a simpler time so they can decorate their homes and yards with items that inspire them to slow down and take time to enjoy life. 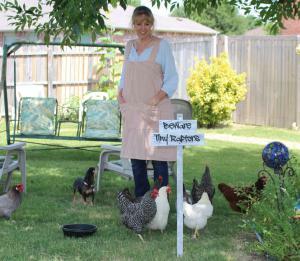 For the first time, Nikki has created an entire product line with the focus of backyard chicken farmers and gardeners. 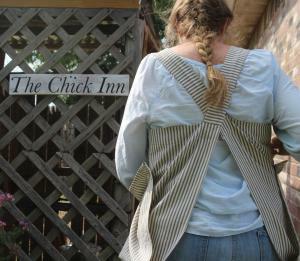 The collection includes two styles of aprons, and several backyard and chicken coop signs that will add some whimsy to your yard. The aprons are designed to be practical and help with the collection of eggs and garden produce by, when the need arises, easily converting from a simple apron to a gathering apron. Made from old-fashioned cotton ticking material, these aprons also showcase a nostalgic feel that harkens back to a time when life was less chaotic. The signs are cut from reclaimed rustic wood by Charley and painted and hand-lettered by Nikki with fun sayings that hopefully bring a smile to the face of the reader. They are sealed for outdoor use, so the enjoyments will last for years to come. The Farmhouse Fresh Collection ranges in price from $29 to $65 and will be exclusively sold on NarleyandChikki.com where the limited products are expected to sell out by the end of the season. Nikki is excited to welcome her fans to her the new handmade product line collection.